Urinary tract disorders are notoriously difficult to diagnose. Overlapping symptoms from disorder to disorder and subjective biases from both patient and clinician can be difficult to overcome. “Many well-meaning physicians tend to treat specific urinary tract disorders as general voiding dysfunctions when that may not be an accurate diagnosis at all,” said Scott MacDiarmid, MD, FRCPSC. Video urodynamics, an in-house diagnostic procedure utilized at Alliance Urology Specialists, is the ideal tool for distinguishing actual urinary tract disorders from other conditions. Urodynamic (cystometry) techniques measure bladder volume and pressure, providing the most accurate diagnoses of voiding dysfunction available. These tests are the only true functional tests of bladder function. 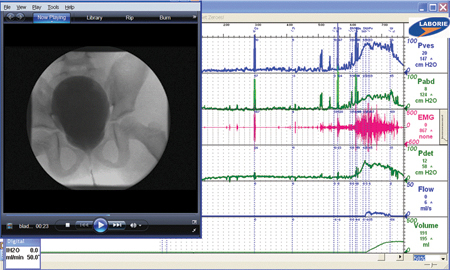 Video urodynamics combines conventional urodynamics with X-ray fluoroscopy. Video urodynamics combines conventional urodynamics with X-ray fluoroscopy, which allows physicians to visualize anatomic and physiologic detail during the test. The simultaneous fluoroscopy helps maximize the diagnostic benefit of the procedure. At Alliance Urology Specialists, video urodynamic testing is an in-office procedure that takes approximately 35 minutes. A small catheter is placed into the patient’s bladder as well as into the rectal area. The patient then sits while X-rays are taken using a fluoroscopic C-arm. Who Can Benefit From Video Urodynamics? Alliance Urology Specialists is one of the few practices in North Carolina offering state-of-the art video urodynamics, and is recognized by PHARMA for its expertise in performing these studies.